My salt & pepper shakers bit the dust a few months ago, and even after looking and looking, I couldn’t find anything I loved. The ones that I had had looked just like mason jars, and I really loved them, so I decided to make my own! 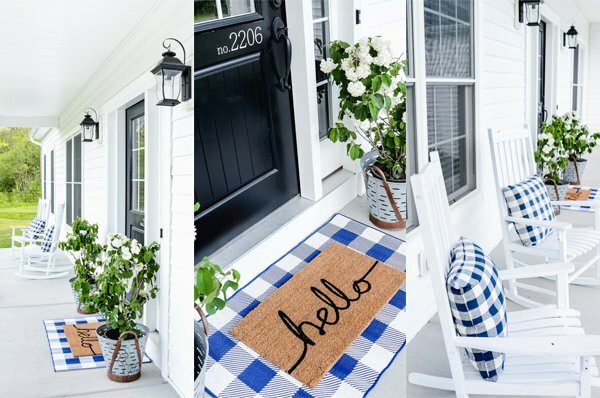 Talk about EASY…this just might be the easiest project ever! 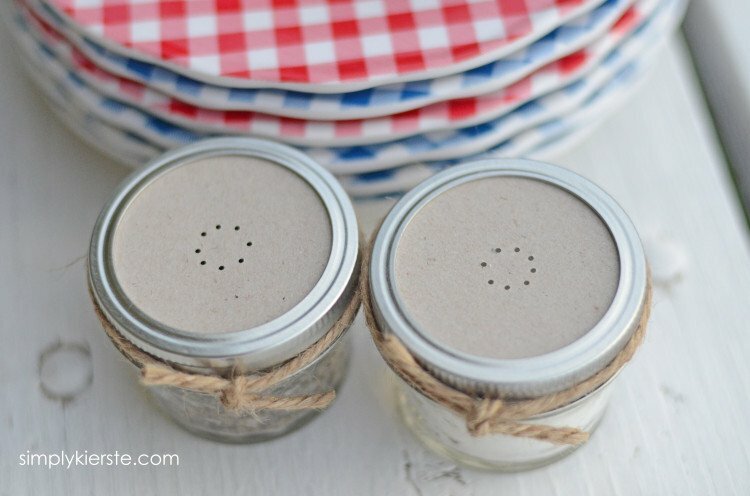 It only took a few supplies and about 10 minutes to make the most adorable Mason Jar Salt & Pepper Shakers! I seriously LOVE them. They look so cute on the table, both indoors and out. If you’re entertaining, and need several sets of shakers, these are perfect, since they’re so inexpensive, easy-to-make, and charming. Think how fun a set of these would be for a wedding gift!! 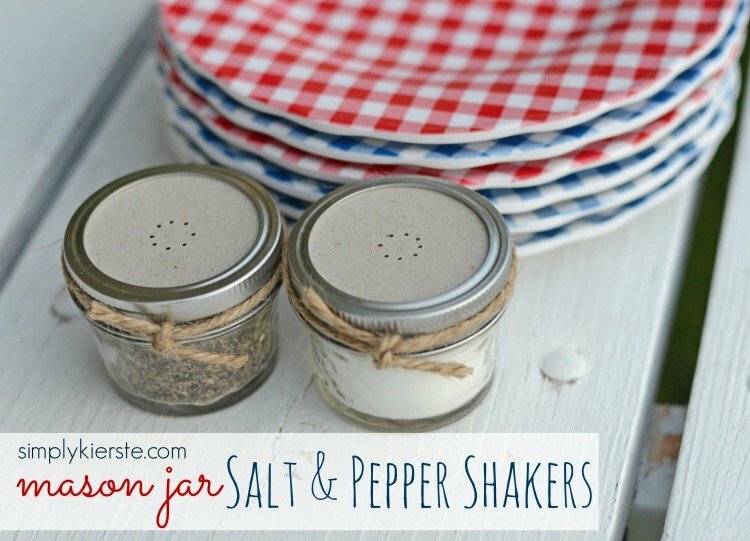 You need to use the smallest mason jars available, so they’ll be easy to hold and use. I used the 4 ounce jars, which only come in the quilted pattern (at least that I’ve been able to find). I would rather have the traditional jar pattern, but I needed the size, and they’re still darling! Since the jars are see-through, you can use the same pattern on each jar, but if you want to make them different, you can totally do that too! 1. Trace the flat mason jar lid onto a piece of chipboard or a cereal box, then cut it out. You’ll need two! 2. Use a tiny hole punch to punch a circle of holes in the chipboard–this will allow the salt & pepper to come out. I just put my hole punch on the circle as far as it would go, punched a hole, then moved it over a little bit, and punched again. I repeated this until I made a complete circle, making sure that my holes were spaced the same. 3. 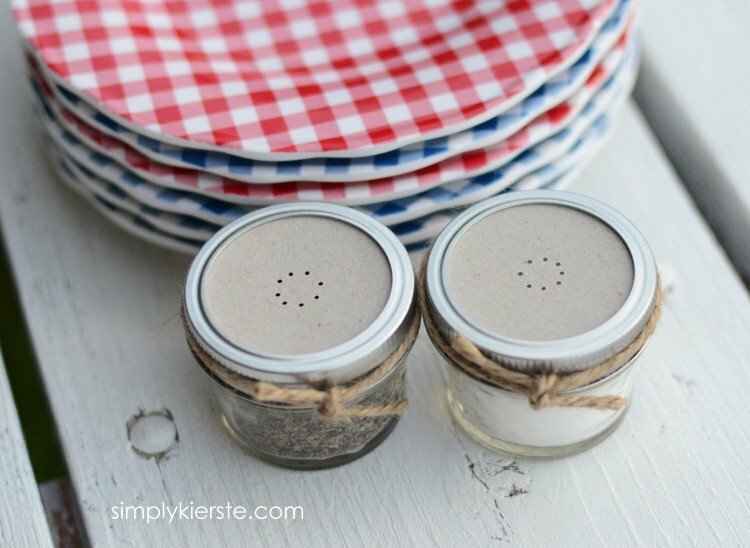 Fill your jars with salt & pepper, then replace the flat lid with the punched chipboard circle, and screw on the ring. 4. Tie a piece of jute around the ring, and you’re finished! Cute!! I need to make a set of those for our picnic table! Those plates are darling too! Where did you get them? So festive for summer! that is such a cute idea! I would have to make the letter s for salt and p for pepper. I have to put my own littlw spin on everything I make! Thanks for sharing! I love mason jar crafts! These are adorable, Thanks for sharing! We use the larger mason jars and the renaissance fair I work at in the spring. They just use a nail and punch through the metal flat top to make the holes, I think a small drill bit would make a cleaner hole then the tops of your small adorable ones would be washable as well. I would use a marker to mark the letter I wanted on the metal lid or on a paper taped to the top of the lid and drill through it to make them. There should be food safe paints you could use on the lids, I found red and white check lids for the larger mason jars. I want to drill a straw sized hole in them to make drinking jars for the family. Nothing worse than coming back to your drink to find something swimming in it when we eat outside. I save the jelly that comes in mason jar type jars. Sadly the lids won’t fit so I’ve started saving the lids that come on the jelly as well, going to drill through those lids. Been thinking to use the jar lids I bought to store things in mason jars in my kitchen. Will look much better than how it is now. I’m looking for those cute little jars for the salt and pepper. I want to glue candlestick holders to the bottom of the short ones like you used for the hot fudge for wine or margarita glasses. They would also work for an ice cream dish. So many ideas from this idea of yours. I didn’t think about food safe paints! I’ll have to look them up! It would open up a whole new world for mason jars, lol! I love your ideas—you’ll have to share pictures! !